I’m finally back to share the work we did on the upstairs in our new home. It has taken a while because my memory card got damaged. It’s been quite the event trying to retrieve the photos. I learned my lesson and will start pulling photos from my card immediately rather than waiting. Live and learn. To recap, we made a list of the things we wanted to accomplish prior to moving in that would be very difficult after furniture came in to the home. So that list consisted of painting all of the walls, lacquering the kitchen and built ins, and replacing the flooring upstairs. Today I am sharing the upstairs reveal as well as how we made a flooring choice that we love. 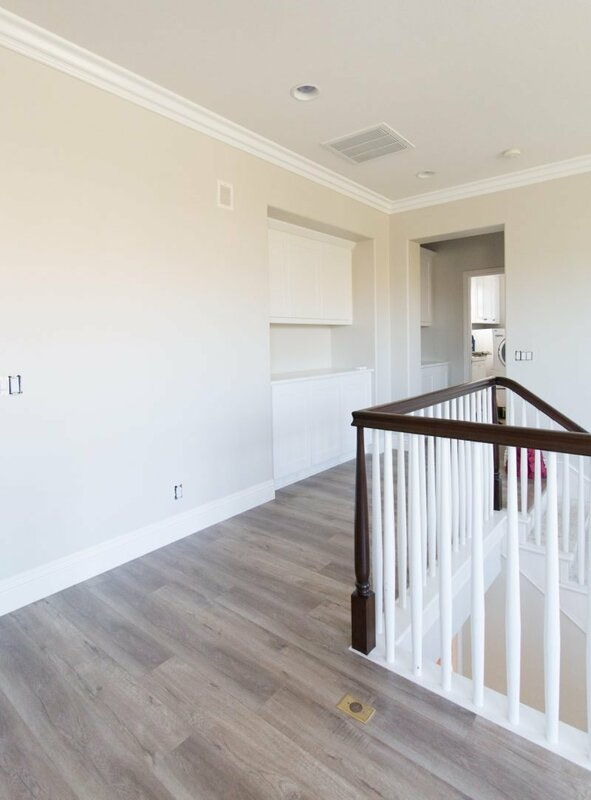 We continued using Pale Oak by Benjamin Moore all throughout the house. I have had a few readers asking about the color and how it looks at different times during the day. First and foremost, paint colors look different in EVERY home. If you are flirting with using this color, I recommend putting up a large sample in a few room and seeing how you like it. I do know that when the painters put a sample up in our family room I panicked. I knew I loved this color, but it was reading too dark to me. I had them put it up in other spots and it was then that I realized I really did love it and some walls will always read a bit darker. 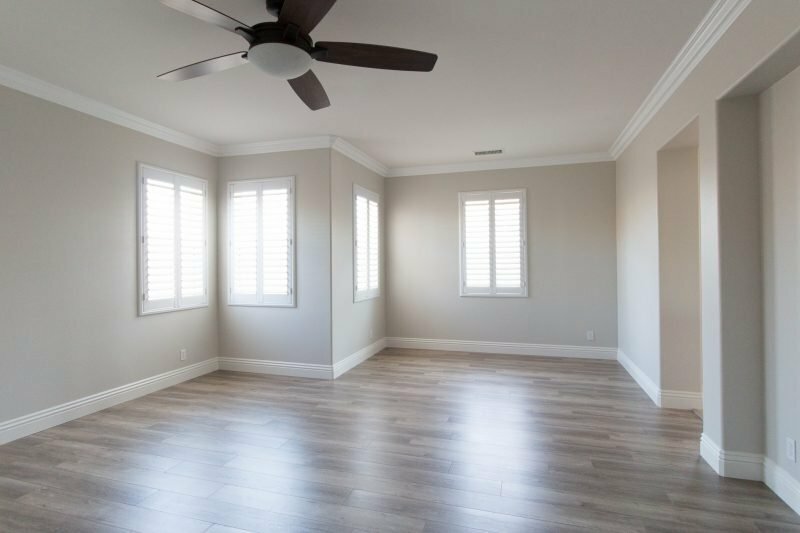 No matter what paint color you may see on a blog or on a paint chip, you really do need to try it in your own home with your particular lighting situation. The trim is White Shadow. 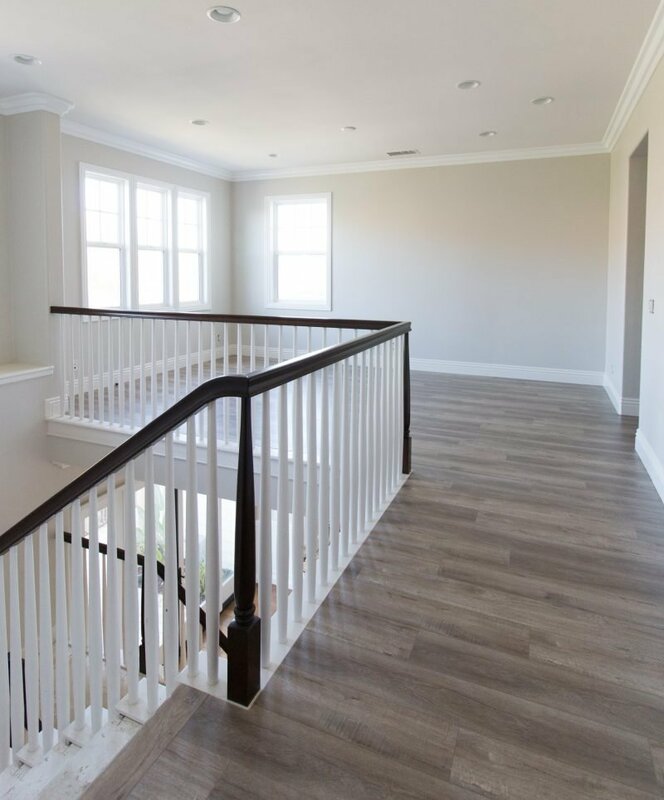 We are really happy with how the darker handrail turned out and it’s a nice contrast with the walls and white railing. This loft area is reserved for the kiddos! It is such a nice spot for them to play games, hang out with friends or watch a movie. This is where we have our sectional from the last house. It’s a perfect fit and comfy for the family to snuggle on. We also have the Wii up here and there are plenty of nights where our family works up a sweat with Dance Wii competitions. Good thing there is no video footage of it! Let’s just say it’s a pretty competitive group. You can tell these were snapped right after the work was done as we still hadn’t even replaced the outlet covers. And we have yet to put hardware on those cabinets. I bought it but it has sat in the same spot for a few weeks now. Baby steps. With school starting and our in laws here it’s been all about getting the children acclimated and settled. Do you remember the bathroom before? It was actually a really pretty blue but we continued the Pale Oak in here as well. 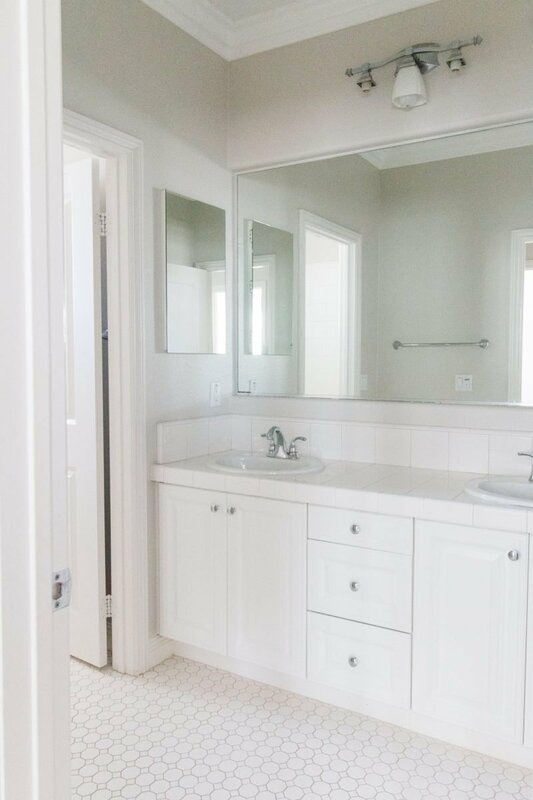 Prior to moving in the master bathroom cabinets were lacquered and we installed a new quartz countertop. I had shared in a previous post that this remnant was leftover from the bathroom we redesigned in our previous home. 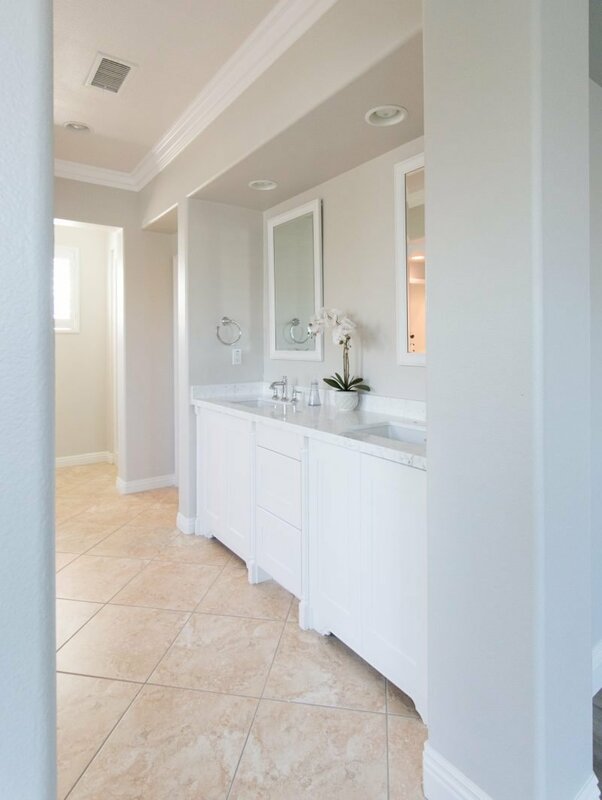 I must admit I am missing my herringbone floors and may do something similar down the road but for now it is not a priority and we are loving the light and bright feel of the bathroom. Here is a peek into the master bedroom. This house has such beautiful bones and is a wonderful layout for us. All we did was freshen up the paint and the flooring. Speaking of flooring, we are crazy about what we chose and I wanted to share a bit about that process. The downstairs boasts beautiful dark wood floors. We knew we wanted to go lighter upstairs as it would have been nearly impossible to match the downstairs color and French bleed style. So we set out to find a light gray/taupe hardwood to use. We do our research and visited 3-4 stores. In every single one, as we were picking out samples, the owners asked us why we weren’t considering laminate. Ummm. Well. I don’t know. We hadn’t looked at laminates since we got married 13 years ago. Holy cow. They have changed. They have come such a long way. The planks even have texture now. So we began to open our minds to looking at laminate flooring. Every single owner said they have used it in their own homes. And the huge draw for us was that it is fairly indestructible and half the price. HALF THE PRICE? Sold. It was a very easy decision when it came to actually choosing the product. Both of us fell in love with this one immediately. I knew it would look great with the wall color and provide the light, neutral look we were going for. This product is by USA Top Flooring and is called Caramel Swirl. We LOVE it. Here is a look at one of the other bedrooms. Fresh and ready to move in. The color of the floor looks off in this photo. It’s definitely more of a creamy/gray/taupe. HOW DO WE LIKE THEM? We don’t like them, we love them. The floors are so easy to care for. I swiffer them when they get dusty and occasionally use a warm damp cloth on them ( in the playroom ) although you didn’t hear that from me. They really tell you to keep them dry. I find that a barely wet warm cloth works wonders. But as I said, that is not the professional advice you will get from installers. The color goes with everything and overall we feel we made a great decision for our family. It’s already magical to see how removing the carpet from my son’s room has helped with his night time allergies. I had forgotten to snap a photo of the hall bathroom so I did so on my phone. I love the classic tile on the floor and we now have a blank canvas. My son swapped out the hardware on the doors and drawers himself. So cute. He is learning DIY skills as we go and following in his dad’s footsteps. While we are in no rush, we will most likely change the light and frame out the mirror in the near future. It’s been great starting school in the new house. I think the routine is helping everyone feel more settled. One of our kiddos is still struggling with the change and so we are doing everything we can to help with the process. I am learning that all four of us handle change in a different way and am very thankful that each of our children feel comfortable talking to us. Now if we can just have the secret to keeping that communication going as they grow into teenagers. If you all know the secret, please share. BONA makes a wonderful mop for laminate flooring that allows you to spray a little of their product ahead of the mop. It is instantly wiped up by the mop pad and works wonders in the kitchen where dry mopping would serve no purpose if you are as messy as I am when cooking! 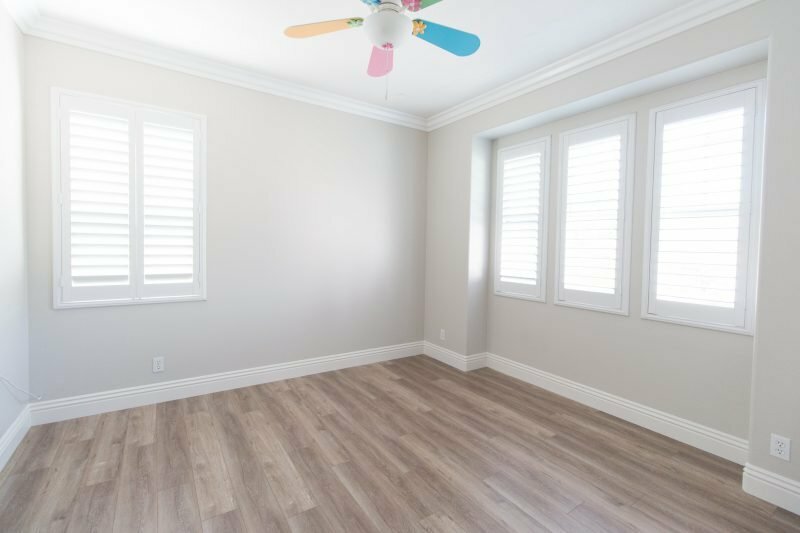 Love the color of your new flooring! It is beautiful and laminate is absolutely indestructible. The colors they have now look so much like wood. Would you please share the name of your cabinet painter with me? I’m looking forward to seeing how you put everything together. I’m sure it will be amazing. OMG, they are laminate?!? they are gorgeous!! We were just getting ready to refinish our current wood floors….and this has given me pause. thank you for sharing. your house looks so gorgeous and you are SO smart to make these updates now, bc, after living in our new home for 14 months now, it is a gigantic PIA to do it after the fact! The floors are gorgeous. Yes, laminate has come a long way. My parents have it and it has held up well with the traffic created by their dogs. Praying things get better for your sweet kiddo. Yes, all handle change differently. Mine both hate change! Always have. I moved a lot as a kid, and I hated it (we didn’t always change schools). I guess that is one reason we have stayed in our home so long. Keeps us all grounded. 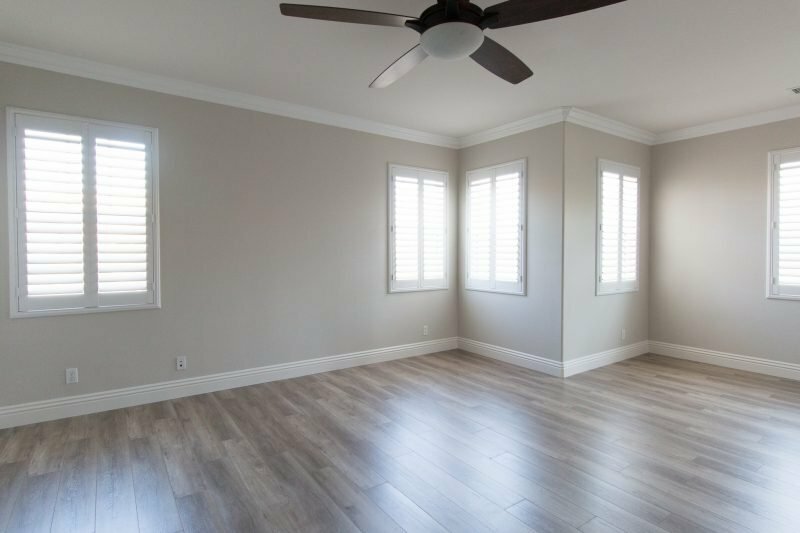 Your floors are beautiful and what a beautiful home! I’m ready to start my garage floors now that the weather is cooling down, but look forward to hearing your tips. Thanks! Love your floors! Three years ago we replaced all of the carpet in our home with a beachy-looking laminate, and it has been just great. It has stood up so well to kids/dog and most people think it’s wood anyway! That should say freedom WITHIN boundaries! Beautiful flooring! We have very similar laminated wood floors like yours and it has held up great! I absolutely love them. I use a steam mop once in a while to get the floors cleaned. It’s great because it has 3 different level of water usage and can be used for tile floors as well. It is totally amazing that you have been able to make so many changes in only a few months. You were so fortunate to have the remnant for the quartz countertop. Everything looks really fresh and lovely. Gorgeous house! I find one of the best communication spots is in the car – seems like that is where so many conversations happen. Wow…it’s a whole new house!!! 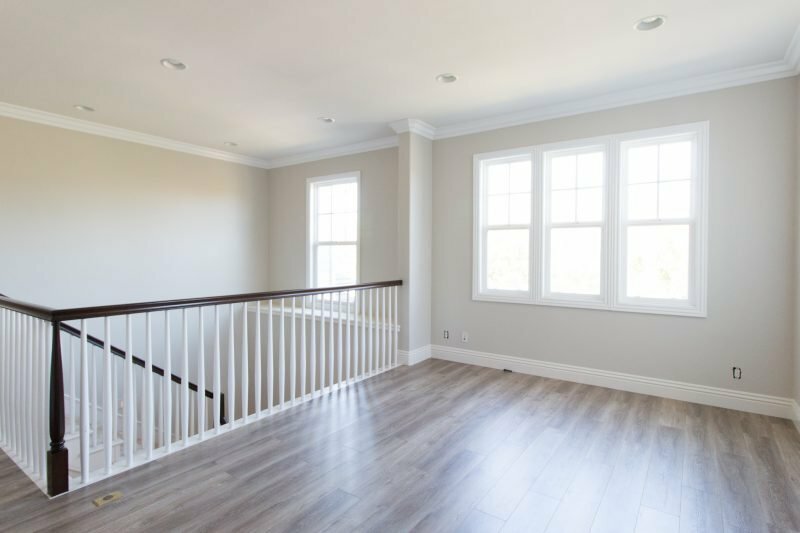 Everything is so bright and airy, I know you must be thrilled everytime you walk upstairs! Miss S struggled when we moved, even though her school and routines all stayed the same. She’d only ever known the other house, and it took awhile before this one felt like home. She still gets a little teary when we drive past the old house…18 months later!! I just try to stay patient with her, and hope this will be the home she remembers once she’s grown! Your new home is coming along beautifully. We are in a similar situation, replacing carpet on the stairs and upper level. I was wondering what is your plan for the stairs, to match the hardwoods on the lower level or the laminate on the upper level? Was wondering if you could share where you purchased your flooring? I’m getting ready to purchase flooring for our new house and really love your pick!! We’re planning to build a new house, and I’m considering going with laminate again. I really like the hardwood planks, though, so I am actually thinking about doing real hardwood downstairs and laminate upstairs. My middle child is already dreading the move, and we are still 3-5 years away from breaking ground. 🙂 I think he’ll love the new house once we’re there, but it might be a harder transition for all of us than I imagine. I’m glad you guys are starting to feel settled. You continue to amaze me with your eye for detail. Your home is absolutely gorgeous! I love the flooring, and the contrast of the black and white stair railings. I love the choices you made upstairs! 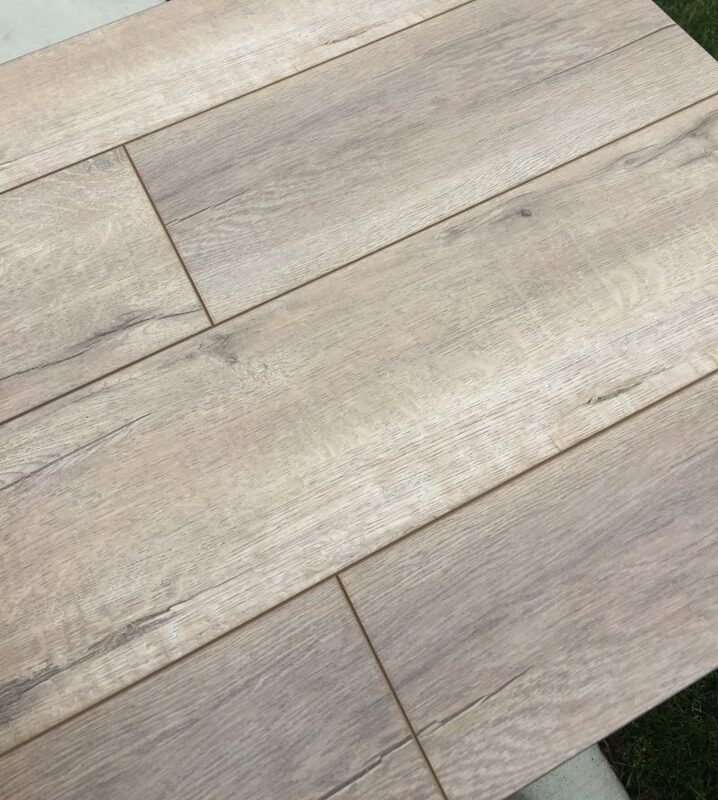 We are considering pale oak for a remodel we’re doing. What color did you use on the ceiling?